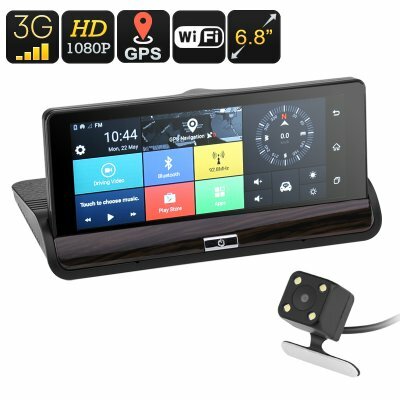 Successfully Added Android Car DVR System - 6.8 Inch Touch Screen, Dual-Camera, Android 5.0, 3G Support, WiFi, Google Play, GPS, G-Sensor to your Shopping Cart. With this Android DVR system for in your car, you’ll always be able to keep track of what’s happening around your vehicle. Coming with two cameras’, this car DVR system guarantees that not a single movement around your car stays uncaptured. Additionally, it comes with an Android OS and it supports 3G connectivity, making it so much more than a regular dash cam. On its beautiful 6.8-Inch display, your passengers will be able to browse the web at any time, watch movies, and play games while on the move – ensuring that there’ll never again be a single moment of boredom within your car. Both the front and rear camera of this car DVR support a wide viewing angle and a 1/4-Inch CMOS sensor thanks to which they are capable of producing detailed and high-resolution footage. With an effective range of 10 meters, both cameras provide recognizable images which may come in handy during potential upcoming road disputes or unfortunate accidents. From now on, you can be assured that you’ll never be bothered with false insurance claims again – as this Dual-Camera car DVR keeps track of whatever happens around your vehicle while you’re enjoying your upcoming road trip. Supporting up to 16GB of internal storage and the possibility to add an extra 32GB through external memory – this FHD dash cam truly offers all space needed to store your upcoming recordings. Thanks to its G-sensor, it furthermore makes sure that not a single second of valuable footage gets lost in case of an unfortunate accident – guaranteeing that you’ll always have the evidence needed securely stored on within your car DVR. Being easy to install – this dash cam is a great asset to any vehicle out there. Besides its regular DVR features, this car dash camera furthermore supports a highly accurate 66-channel GPS navigation system that makes sure you’ll never get lost again. No matter where your upcoming road trip may take you, with this car DVR system and GPS navigator at your side, you’ll always be able to reach your destination in the fastest and most efficient manner. Whether you use it for security purposes, for GPS navigation, or to entertain your passengers – this car DVR has the answer to all your on-the-road demands. This car DVR kit comes with a 12 months warranty, brought to you by the leader in electronic devices as well as wholesale electronic gadgets..
3G card can only be used for 3G Internet access, can not be used to call. Arabic: - نظام DVR السيارة - Chinese Simplified: - 汽车 DVR 系统 - Czech: - Auto DVR systém - Danish: - Bil DVR System - Dutch: - Car DVR systeem - French: - Système DVR voiture - German: - Auto-DVR-System - Hebrew: - מערכת DVR לרכב - Hindi: - कार DVR प्रणाली - Italian: - Auto DVR sistema - Japanese: - 車 DVR システム - Korean: - 자동차 DVR 시스템 - Malay: - Sistem DVR Kereta - Norwegian Bokmål: - Bilen DVR System - Romanian: - Sistem de DVR auto - Russian: - Системы автомобиля DVR - Spanish: - Sistema DVR coche - Thai: - ระบบบันทึกภาพรถ - Turkish: - Araba DVR sistemi - Vietnamese: - Hệ thống DVR xe hơi.